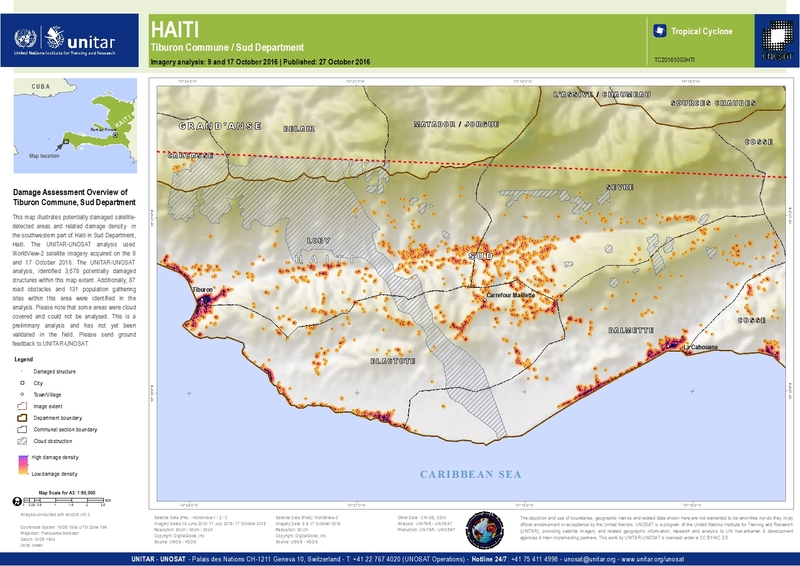 This map illustrates potentially damaged satellite-detected areas and related damage density in the southwestern part of Haiti in Sud Department, Haiti. The UNITAR-UNOSAT analysis used WorldView-2 satellite imagery acquired on the 9 and 17 October 2016. The UNITAR-UNOSAT analysis, identified 3,678 potentially damaged structures within this map extent. Additionally, 87 road obstacles and 131 population gathering sites within this area were identified in the analysis. Please note that some areas were cloud covered and could not be analysed. This is a preliminary analysis and has not yet been validated in the field. Please send ground feedback to UNITAR-UNOSAT.